Although, I have actually met Francisco Carbajal, the CEO of Ndigenous Visionaries (a company owned and run by people of color) and the person behind the “Shoot Cops” T-shirts, the news report within this post was submitted anonymously by a reader, via the Cop Block Submission page. With so much police violence going on locally and globally we decided to drop this tee. We don’t mean pick up a gun an pull the trigger, we mean any interaction you have with a police officer pull out your phone and record. Filming police officers is not illegal. Together we can prevent casualties. Let’s go out there and SHOOT COPS! 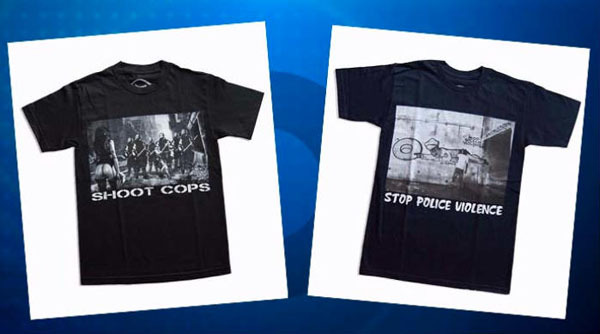 One of the criticisms of these shirts is the obvious (and intentional) shock value that the statement “shoot cops” creates. That’s something that invites that sort of criticism, but it also attracts attention. Beyond that, if someone is able to deal with the initial hostility it will create amongst some people, it provides an opportunity to have a conversation about the state of policing specifically within Las Vegas and also nationally, as well. Secondly, here’s a news flash for Former Lt. Randy Sutton, people are losing respect for the police because of all the murders they are committing and the complete and absolute lack of accountability for those murders. It’s not because of a T-shirt or something someone wrote on a sidewalk. Closing your eyes to that and holding fake support rallies for yourself that nobody outside of cops and their families attends won’t change that. Accountability will. The truth is that the number of cases involving brutality and outright murder within Las Vegas, along with the historical lack of accountability is itself shocking. the idea that not one single cop in the 100+ year history of the city of Las Vegas has ever been in the wrong when they shot someone is ludicrous. Yet that is the record of “accountability” that the LVMPD and other Las Vegas area police departments have. The message that Metro and their leadership are sending with that should be no less controversial than these T-shirts.